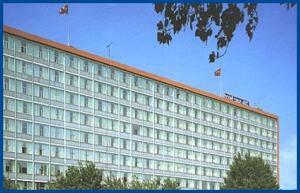 Hotel Casa 400, Amsterdam discount hotels and accommodation. The hotel is conveniently located close to the city, near the Amstel station with fast connections to the city centre and the A10 freeway, close to all tourist attractions. The Frankendael Park and Middenweg shopping area are within walking distance. There is public parking outside the hotel for private cars and tour busses (paid parking from Monday through Saturday, 09.00-19.00 hrs.). Hotel CASA 400 is with 400 rooms the largest 3 star hotel in Amsterdam. With the hotels friendly atmosphere, but most of all, because of the personal service, you will feel at home right away. All rooms have a private bathroom with shower and toilet, and are equipped with TV and telephone. The hotel has an à la carte restaurant, cosy bar, coffee corner, lobby and a sunny terrace, which can be enjoyed after a pleasant day spent in Amsterdam. The hotel also has a souvenir shop in which a wide selection of specific Amsterdam and Holland souvenirs can be found. In short, the ambience, location and friendly prices of Hotel CASA 400 will make your stay in Amsterdam a very pleasant one! View photos, room descriptions and make online reservations at Hotel Casa 400. Save on room prices at Hotel Casa 400, Amsterdam.